Adm. Fargo has served as a member of the Board since July 2015. Adm. Fargo is a retired military commander with subsequent private sector experience in maritime and other transportation industries. As commander of the U.S. Pacific Command from 2002 until 2005, Admiral Fargo led the world’s largest unified command while directing the joint operations of the Army, Navy, Marine Corps and Air Force. In this role Admiral Fargo acted as U.S. military representative for collective defense arrangements in the Pacific, ultimately responsible to the President and the Secretary of Defense through the chairman, Joint Chiefs of Staff. Admiral Fargo’s naval career included six tours in Washington, D.C. and extensive duties in the Pacific, Indian Ocean and Middle East including serving as Commander-in-Chief of the U.S. Pacific Fleet and Commander of the Naval Forces of the Central Command. 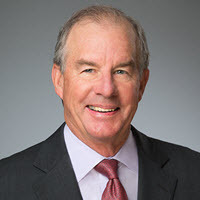 Admiral Fargo serves as Chairman of Huntington Ingalls Industries, America’s largest military shipbuilder, and on the Boards of Directors for Hawaiian Electric Industries, Matson and United States Automobile Association. Previously, he served on the Boards of Northrop Grumman Corporation and Hawaiian Airlines.